The Real Thing is the real equation apparent in this sophomore album released by Bo Bice following his time in the American Idol spotlight. This is The Real Thing - in the world of Bice. He rolls and rocks and revels in the rock-a-billy stylings that this man is obviously most comfortable expressing himself within. This is The Real Thing when it comes to Bo Bice's heart, his soul. Turning on the album the listener is treated to a hearty mix of Southern soulful rock and roll with a twang of Country-at-heart thrown into the mix. I find "Witness", the first track, striding out with a retro sound. It harkens back to a definite 1970's vibe. A little bit of MoTown creeps into the tone, and don't miss the "Frampton Comes Alive" voicebox sound. But hey, that fits in with the mix because what is rock-a-billy if not a conglomerate of new and old? I will say I'd rather hear The Biceman's vocals anyday over Peter Frampton's. Second track on the album, "Take the Country Outta Me", is a strident twist into the roots this man derives his musical heart from - lyrics such as, "I grew up on Merle Haggard", he references ZZ Top, and includes of course, "Free Bird" (Lynyrd Skynyrd). Bice carries on to extol Marshall Tucker, Waylon Jennings, Willie Nelson and Johnny Cash, Jimmy Rodgers, JJ Cale - basically a long shout out to paint the picture of what and where his heart comes from musically. This tune may come out as bar brawling, beer drinking music, but the man's paying dues to who fulfilled his mind and enlivened his musical soul. "I'm Gone" is a tune with Bo giving his drawling best raw music-man vocals. The mixing put me in mind of his old SugarMoney sound. "Only Words", incorporates a glorious steel guitar introduction. I found this quite an introspective tune. As a side note, I love the background vocals, the gal has a kind of EmmyLou Harris sound - she compliments him very nicely. This track also includes an endearing blubbering saxophone which compliments the vibe. The next track, "Only Words" hits me as a fine tune, very bar band Southern Rock, smoky, summing it up in four words, "Pass the Jack Daniels". "See the Light" has this whole, to use a semi-current Pop culture phraseology - "Brother Where Art Thou" vibe. Opens with a mellow mouthharp, rolling rhythm and blues groove, and a great flow. Religious overtones as Bo exhorts all to come on down pay their dues, recognize and repent. It's all about letting it 'shine'. The next song is mine. "Sinner in a Sin". Bo gives it a more country twang than I've previously heard on other recordings and it fits the lyrics and the theme. Mellow harmonica flavors the song, the lyrics, "Loser that never wins, poet without a pen always been and doing it again" reverberates within my very soul. It's a song about lost love, about dreams not realized quite yet, regret about frivolous pursuits. The song also carries the theme running under the current of this entire piece of work: retribution, repentance, forgiveness. This song touches me in a personal way, emotionally, every time I have heard him sing it. I adore this treatment of it. Bo Bice - "Sinner In A Sin lyrics"
"This Train" is a cool rolling tune, more uptempo, yet still retaining the religious undertones. 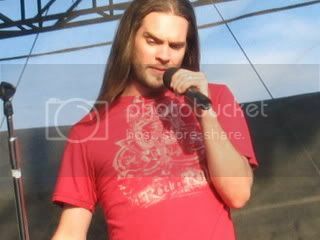 Bo Bice is singing his life and times as most artist will do; this tune relaying the carrying on he's done through bad and the good times. Bice has experienced life threatening situations with illnesses he's fought and this song feels like an anthem to keep on keeping on no matter what is happening. The next track, "Ain't Gonna Die" finds Bo Bice all rock n roll righteous. He hits old school with a killer Molly Hatchet groove. "Whisky, Women and Time" is one of The Biceman's older tunes, very Allman Brothers sounding, you feel and hear that influence. On a personal note to the artist: Bubba, you're no longer that poet without a pen. The Sun's shining down on you. Much Love and Much Success.